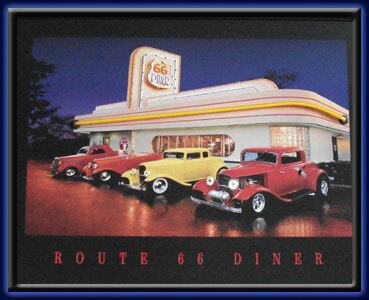 Tuesday nights at the diner was an opportunity to show off your wheels and impress the chicks...Recreate the day at Route 66 Diner, another great scene from Vintage America. Lighting Effects: Yellow neon tube around the building. 33 sequentially flashing yellow, red and green L.E.D. lights on the sign on the top of the roof. 13 yellow L.E.D. lights around the roof. 6 yellow L.E.D. lights as car's headlights. 2 white L.E.D. lights as car's headlights.